I have ten years of tutoring experience. I've always been told I am good at explaining hard materials into easier and understandable concepts. Parents think that I have good patiences with students. I graduated from University of Washington with an Electrical Engineering degree. I started tutoring my friends and classmates in high school and found the passion in teaching. With having good feedback from the people I tutored, I've developed a stronger teaching skill as years go by. Being influenced by my mom, a high school teacher, I've comprehended her teaching skills while with my observations of my teacher and professors' lectures, therefore developed them into my own strength. I truly believe that there's a method in teaching, and I am confident that I can provide the help you will need. My tutoring experience includes Mandarin Chinese, math, Java, statistics, chemistry and physics. I will evaluate my student's level of knowledge in math at the beginning of the lesson. Then I will come up a lesson plan based on the evaluation result and the preparation time we have till the test date. Different teaching methods will be applied to students accordingly since everyone learns in different ways. For example, for students having low confidence in math, I will first build their confidence up prior to showing them how to do difficult and complex problems. For students who are already strong in math and want to move to the next level or to get a perfect score, I will show them advanced math solving techniques, as well as how to tackle unfamiliar or never seen problems. In general, depending on students' math proficiency and the length of the prep time, I will choose to do a quick or a thorough comprehensive review to solidify their foundations in math, and work towards getting a decent or perfect score. I have the ability to walk my students through each problem step by step to improve their understandings in the process of solving math problems, as well as build their confidence up along the way. I am able to identify and reinforce any important concept my students are not familiar with, as well as help them to learn/refresh math solving techniques. In high school, I’ve scored a 5 on the AP Calculus BC test. In college, I’ve completed 6 math courses at the University of Washington, including the calculus series. I am a native Chinese speaker from Taiwan. I can teach lessons in Northern accent(Standard Chinese) or Southern accent as your choice. I have the ability to teach you all levels of Mandarin Chinese including literature and ancient poetry. I am not only fluent in Mandarin Chinese, but also in English which help me teach more effectively. I provide a systematic way to help my student memorize vocabularies (Simplified & Traditional) as well as different teaching methods according to students' needs and level of proficiency.I believe that language isn't a hard subject to learn; however, having the environment is one of the key points. I can provide an all Chinese environment while tutoring with not just the language as well as the culture. I've tutored Java since college and I am a software developer for Android app as well as IOT products. Programming can be challenging when a logic is stuck and you have no idea where to start in order to solve it. That is the time when I jump in to help. No matter if you are taking a CS class or doing a project on your own, I can not only help you walk through and get the problem done but also help you think through the logic and algorithm. I once struggled with learning programming myself, so I know how to help someone who is stuck in the learning process of the language. If you are interested in me being your tutor, don't hesitate in contacting me and we can talk more into details. Rate details: Cancel/reschedule within 24 hours may be subject to a fee of 50% of the lesson charge, 100% for no-show or cancelling within 3 hours. I provide a systematic way to help my student memorize vocabularies (Simplified & Traditional) as well as different teaching methods according to students' needs and level of proficiency. I can teach lessons in northern accent(Standard Chinese) or southern accent as your choice. 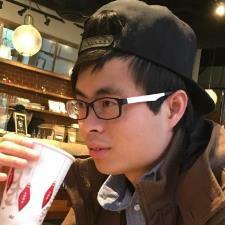 I was born and raised in Taiwan and came to Seattle at the age of 16. Therefore I am not only fluent in Mandarin Chinese, but also in English which help me teach more effectively. I have the ability to walk my students through each problem step by step to improve their understandings in the process of solving math problems, and build up their confidences along the way. I am able to identify and reinforce any important concept my students are not familiar with, as well as show them advanced math solving techniques for difficult and complex problems. Honor Algebra: 4.0. I have the ability to walk my students through each problem step by step to improve their understandings in the process of solving math problems, and build up their confidences along the way. I am able to identify and reinforce any important concept my students are not familiar with, as well as show them advanced math solving techniques for difficult and complex problems. Honor Geometry: 4.0. I've successfully helped many students raise their SAT math scores by 200 points in 1 to 2 months. I will evaluate my student's level of knowledge in math at the beginning of the lesson. Then I will come up a lesson plan based on the evaluation result and the preparation time we have till the test date. Different teaching methods will be applied to students accordingly since everyone learns in different ways. For example, for students having low confidence in math, I will first build up their confidence prior to showing them how to do difficult and complex problems. For students who are already strong in math and want to move to the next level or to get a perfect score, I will show them advanced math solving techniques, as well as how to tackle unfamiliar or never-seen-before problems. In general, depending on students' math proficiency and the length of the prep time, I will conduct a personalized comprehensive review to build a solid foundations in math, and work toward getting a decent or perfect score. I've successfully help my students improve their ACT math score by 50% in 1 to 2 months. I will evaluate my student's level of knowledge in math at the beginning of the lesson. Then I will come up a lesson plan based on the evaluation result and the preparation time we have till the test date. Different teaching methods will be applied to students accordingly since everyone learns in different ways. For example, for students having low confidence in math, I will first build up their confidence prior to showing them how to do difficult and complex problems. For students who are already strong in math and want to move to the next level or to get a perfect score, I will show them advanced math solving techniques, as well as how to tackle unfamiliar or never-seen-before problems. In general, depends on students' math proficiency and the length of prep time, I will conduct a personalized comprehensive review to build a solid foundation in math, and work toward getting a decent or perfect score. Chiaho helped my daughter with geometry. He started by reviewing and familiarizing himself with the chapter she was having difficulty with, and then he went over each section with her to assess what she did and did not understand. He reinforced what she did know and built up her confidence, and then worked with her to explain the parts she did not know. She said that he explained concepts that she's been struggling with in a clear and easy way, so we are looking forward to continuing to work with him. Thank you Chiaho! Charles has been my daughter’s tutor for Precalculus this entire school year, and he has helped her tremendously. Math is not her strong suit, but Charles has been instrumental in her ability to understand and work through all the concepts. He is patient and very good at explaining things in a way that makes sense and sinks in for her. Highly recommend him as a tutor! Charles made great strategies for working towards increasing my daughter's SAT score. Looking forward to working with him further as she prepares for her first official test. Great start to SAT Prep! Charles is knowledgeable and has a pleasant teaching style. He took his time, allowing my daughter to complete test questions and shared excellent techniques whenever applicable, to help with accuracy and efficiency. Definitely looking forward to future sessions. Thanks so much! we are still workiing with him everything seems to be going well. Charles has been helping our 7th grader in his Math skills in the last couple of months. He is very helpful, patient, calm and supportive. He shows different ways of solving various math problems/concepts, which helps our son to figure out things easily. He is able to simplify concepts, if something is complicated for our son. He doesn't spend time on the areas, that doesn't need attention. he only focuses on the key points, that you really need help. He is open to students/parents input and flexible. Responds quickly. We are happy to recommend Charles. Charles helped my son with his SAT Math. He also left some homework and suggested what he needs to practice on. Charles is an excellent teacher! We highly recommend Charles if your son or daughter needs help in math. We are happy to working with Charles. My two high school age daughters are finally getting the support they need. We hope to see comprehension of concepts and SAT scores grow. We appreciate Charles working with our son preparing for SAT math. My son says Charles explains things well and helps him understand his errors. We are hoping to bring him more confidence at test taking and Charles helps him achieve that goal.